This is a sponsored post in collaboration with Nebraska Furniture Mart. I was compensated for this post, but all ideas and opinions are 100% my own. 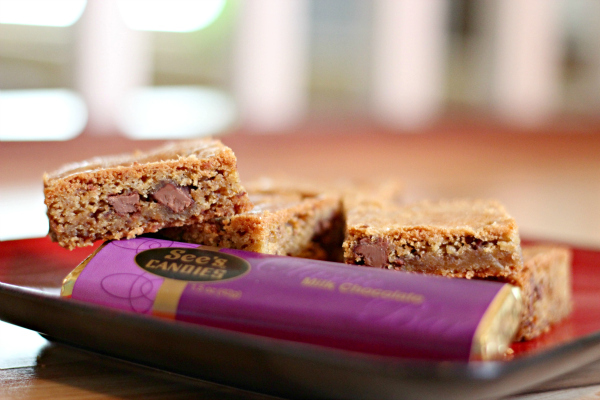 I know most chocolate lovers would reach for a brownie before a blondie, but this one may change their mind! I am a die-hard chocolate lover and I am delighted to find chunks of delicious chocolate inside of a buttery cookie dough. While everyone else is going all death-by-chocolate with triple chocolate brownies (which I love as well), I want the chocolate to be the star, not the everything of my dessert. And let’s talk about toffee. 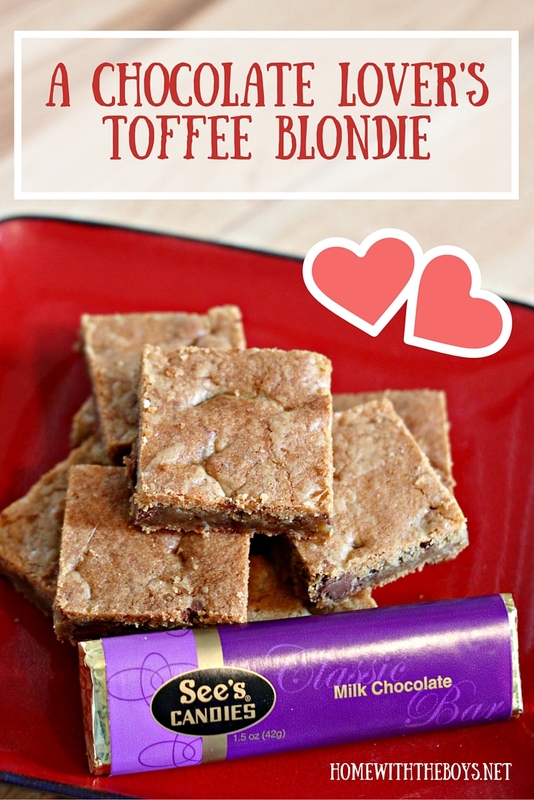 Toffee is my love language. Well, actually gifts is my love language, but toffee is one of my favorite gifts, so there you go. If we’re talking about me feeling loved, chocolate and toffee are a good place to start. Now, not just any chocolate will do. I love all kinds of chocolate – milk, dark, white, semisweet – equally, but different occasions call for particular kinds. For this season of love, I prefer dark chocolate by itself and milk chocolate in my dessert! As Valentine’s Day approaches, Nebraska Furniture Mart is in the mood for chocolate, too! They are partnering with Frigidaire Gallery and See’s Candies to give chocolate to YOU! From February 3rd thru the 16th, Nebraska Furniture Mart is offering a free box of See’s Chocolates with any Frigidaire Gallery purchase. Also during this time, NFM is offering 36-month financing for Frigidaire Gallery products, which are ALL on sale. 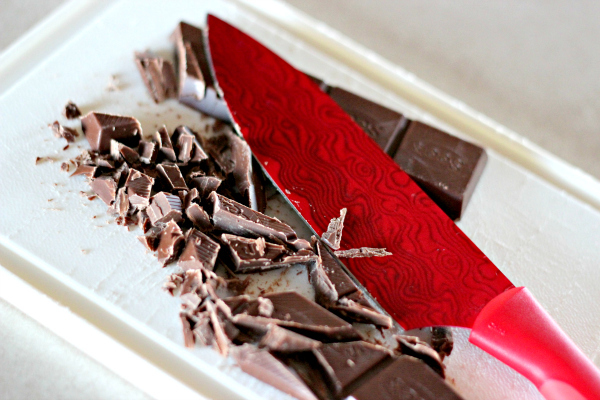 New appliances + free chocolate = lots to love! With all this love going around, I have to share a dessert recipe to celebrate! 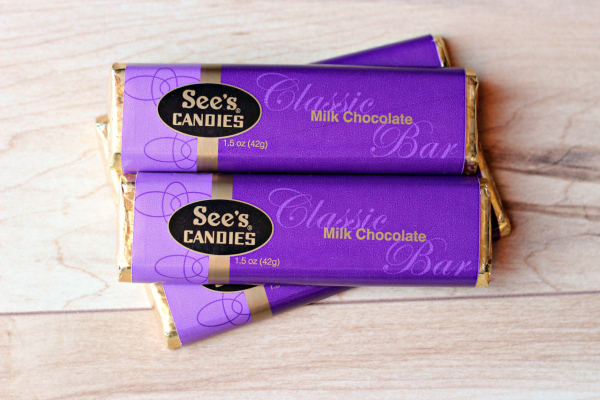 And of course, it includes that yummy See’s Candies milk chocolate! Preheat oven to 350º. Grease a 9 x 13 in. pan and set aside. In a large bowl, cream together the softened butter and sugars with the paddle attachment on your stand mixer or by hand. Add eggs and vanilla, scraping the bowl as needed to combine all ingredients. In a medium bowl, combine the flour, baking soda, and kosher salt. With the mixer on low, slowly add the dry ingredients to the wet ingredients. If mixing by hand, add the dry ingredients in several batches, mixing in between. Gently fold in the chocolate chunks and toffee bits. Spread the dough evenly into the greased pan. Bake for 35-40 minutes, until the top is golden brown and the edges start to pull away from the sides. Cooking time will vary with oven and elevation. Let the bars cool completely in the pan before cutting. Makes 24 bars. How do you like your chocolate this Valentine’s Day? What is your favorite chocolate dessert? 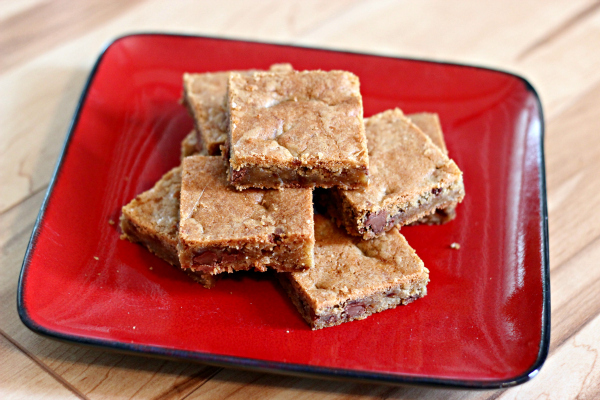 For lots of yummy chocolate treat recipes, check out the Gallery of Sweets here! Wow, these sound amazing!! Hard to go wrong with a blondie, though, in my opinion 😉 Thanks for sharing! I totally agree! Happy Friday!